is a fungal disease (Sclerotinia homeocarpa) that attacks most turfgrasses grown in the South. 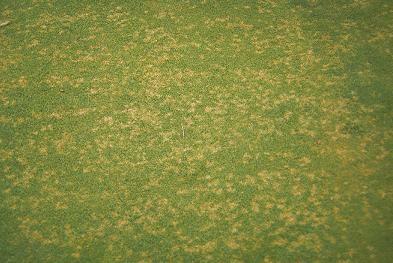 Bentgrass, hybrid bermudagrasses and zoysia are most susceptible to this disease. It occurs from spring through fall, and is most active during moist periods of warm days (70-85°F) and cool nights (60°F) in the spring, early summer and fall. It is spread by water, mowers, other equipment and foot traffic. Symptoms. On fine textured low turf, dollar spot appears as round, brown to straw-colored and somewhat sunken spots about the size of a silver dollars or smaller. In taller coarse textured grasses , the dead spots are larger, more diffuse, and can be confused with brownpatch, R. solani. Dollar spot has lesions on the leaf blades. Lesions are light tan with a reddish-brown border, and usually radiate from the margins of the leaf blade. On fine bladed grasses such as bentgrass, the lesions will girdle the leaf blade. Early in the day before the dew dries, cobweb-like mycelium of the fungus can be seen growing on infected grass. During early stages of the disease, plants may appear water-soaked and wilted, but spots quickly fade to a characteristic straw color. Causes. Low soil moisture has been reported to enhance dollar spot activity, but moisture from dew, light rain or irrigation must be present on the foliage for the disease to develop. Dollar spot is capable of growth over a wide range of temperatures (50° to 90°F), but disease development is greatest at temperatures between 70° and 80°F. Low nitrogen and potassium levels in the soil have been reported to increase the severity of dollar spot. Research has shown that nitrogen increases the susceptibility of grass to dollar spot. Control. To prevent dollar spot, use proper cultural practices and the organic program to promote healthy turf. Avoid light frequent waterings. To cure dollar spot infection, apply a cornmeal or garlic in dry or liquid forms as needed. Applications are most critical during moist weather in the spring, early summer and fall when temperatures are between 70º and 80ºF.